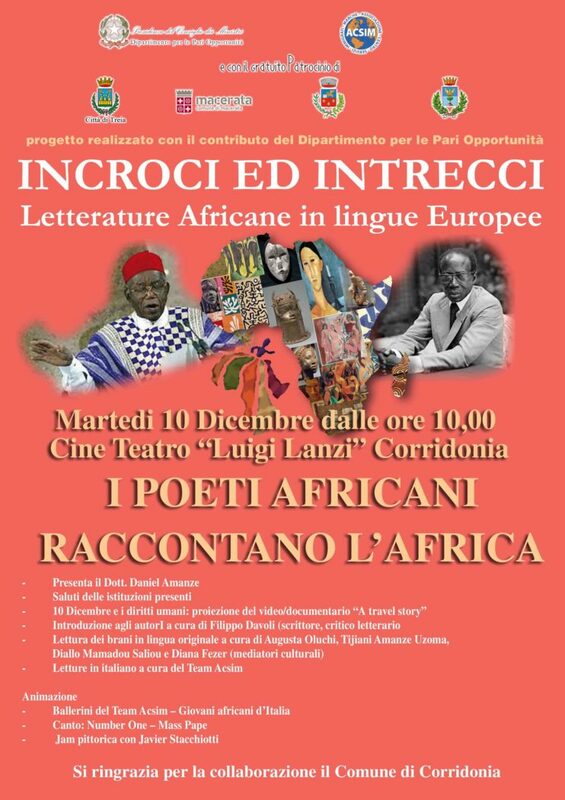 The next meeting will take place in Corridonia, on Tuesday 10th December, starting from 10 am, in the movie theatre “Luigi Lanzi”.The theme of the event is “I POETI AFRICANI RACCONTANO L’AFRICA” (African poets talk about Africa): a summary of the best readings of male and female poets, who have been performed during the previous meetings of the exposition and who express the values, feelings and key-images of Africa in the best way. The choice of the day is not coincidental: 10th December is the International Day of Human Rights. The event will start with the screening of a documentary film “A travel story” (directed by Silvia Luciani) in order to remember how many people in the world suffer the violation of worldwide recognized rights. The President of ACSIM, dr. Daniel Amanze, will introduce the meeting, which will continue with the greetings of the partecipating Istitutions. « ACSIM has celebrated the International Day of Human Rights, in the memory of Nelson Mandela.